In this part of my Java video tutorial, I create the spaceship object and a keyboard listener. I will use the keyboard listener to move the ship around the screen. 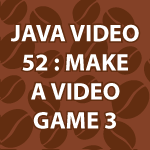 It is so easy to randomly add objects to the game we started making here Make a Java Video Game. I slowed things down a bit here, just to make sure you completely get the process. All of the code is available under the video. Please feel free to ask questions. Could you list the key codes for us, or tell us how to know what number each key is, if there is a method for doing so (such as A = 1, so B = 2, C = 3, etc.)? Thank you, sir. And thank you for the lessons. They are helping me pursue my dream career, despite being unable to afford to go to college. There is no price I could put on that, nor words to describe my gratitude. Thank you 🙂 It is always great to hear that I helped so much!